Mark Miller. Claude Ranger: Canadian Jazz Legend. Toronto: the author, 2017. 280 pp., ill.
ISBN 978-1-77302-561-2 (hardcover, $34.04) / 978-1-77302-559-9 (paperback, $20.96) / 978-1-77302-560-5 (eBook, $6.99). All prices are quoted from the Indigo website as of 24 November 2017; the book is also available for slightly less from Amazon. Two excerpts from the book are on the Point of Departure website here, and Mark Wigmore’s interview with Miller about the book is on the JAZZ.FM91 website here. This is the eleventh book by Mark Miller, the foremost chronicler of the jazz scene in Canada. It marks his first entry into the brave new world of self-publishing, assisted by the Victoria, B.C. based outfit Tellwell Talent. Miller was responsible not only for writing the text but also for assembling the rest of the book, including the discography, bibliography, index, and the photos (many of them taken by Miller himself), while Tellwell produced the physical (and digital) copies of the book and looks after its distribution. The book was released in May 2017 and has garnered a lot of attention and laudatory reviews, e.g. by Stuart Broomer in The Whole Note, Marc Chénard in La scena musicale, Raul da Gama on JazzdaGama, Peter Hum in the Ottawa Citizen, Ian McGillis in the Montreal Gazette, and Michael Morse in CAML Review, among others; there is also a superb and insightful appraisal by Paul Wells in Literary Review of Canada. The high praise and widespread notice are notable for a self-published book, but also well deserved: this is a fascinating tale, beautifully told, and an important contribution to Canadian jazz history. 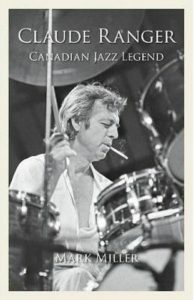 Miller first wrote about Ranger in Jazz in Canada: Fourteen Lives (Toronto: University of Toronto Press, 1982), where Ranger shares a chapter with another Montreal-born jazz drummer, Guy Nadon, who died in 2016 at the age of 82; the chapter is aptly titled “Crazy”. That’s the word Ranger used to describe Nadon, meaning that he was singular, original, odd, and something of a rebel; the same could be said of Ranger himself. Ranger was seven years younger than Nadon, but his life ended earlier, and in a veil of mystery. Miller opens this book with Ranger’s enigmatic disappearance: “On or about November 2, 2000, Claude Ranger left his one-room apartment in a subsidized housing complex on 30th Avenue in Aldergrove [B.C. ], never to return. He was 59. More than 16 years later, his fate is unknown; the investigation launched by the Royal Canadian Mounted Police in early 2001 remains open” [p. 15]. At the end of the book, the narrative comes full circle with a return to the puzzling conclusion of Ranger’s life story: “The first days of November, overcast and cool, found Ranger once more in distress. His response to situations that were beyond bearing had always been to walk away. And so it was again” [p. 236]. In between these bookends, the story of Ranger’s life story unfolds, and in Miller’s hands it makes for compelling reading. Miller deftly combines cogent summaries of international jazz idioms that were prevalent during Ranger’s career with insightful commentaries on the particular qualities of the local jazz scenes in Montreal, Toronto, and Vancouver, where the vast majority of Ranger’s performances took place. Ranger was based in Montreal until 1972, Toronto from 1972 to 1987, and finally Vancouver from 1987 on. He made only one trip to Europe, when he appeared with the Don Thompson quartet in the Netherlands in 1978, and there were only a few trips to the USA. His belated New York debut did not take place until 1990, when he was already 49 years old. There was a disastrous trip to Australia with the Moe Koffman Quintet in 1980. Miller’s account of the fiasco in Australia is characteristic of what makes him a great jazz historian. Multiple conflicting stories of what went wrong during the Australian trip and the circumstances under which Ranger quit the tour are in circulation; Miller deftly sifts the tall tales from the more reliable reports of those who were actually present, but notes that “even their versions of events differ from one another” [p. 133]. His patience and astuteness in piecing together this story are characteristic of his work on the book as a whole. Miller draws on three interviews he did with Ranger himself, one in 1978 and two in 1981, as well as interviews with over 100 other people. He neatly weaves in the voices and opinions of these many people who worked with, listened to, or studied with Ranger. Though not much inclined to teaching, Ranger did create a book of drum exercises (never published, but circulated widely), and via short casual lessons he left an imprint on the two finest Canadian jazz drummers of the next generation, Nick Fraser (in Ottawa) and Dylan van der Schyff (in Vancouver). Ranger was born in Montreal in 1941 and took up the drums at the age of 13; he was already playing professionally by 1959 at the age of 18. He studied music theory with a Montreal violinist named Frank Mella (who is otherwise unknown to me). Another big influence was Brian Barley, a classically trained clarinet player who turned to jazz and played tenor sax and bass clarinet in a trio with Ranger and the bass player Michel Donato. The trio configuration suited Ranger well as, like Ornette Coleman, he didn’t like to play in ensembles that featured a pianist. Barley’s playing in turn was influenced by Sonny Rollins, but he also introduced Ranger to the music of Debussy, Stravinsky, and Ravel via recordings. Tragically, Barley died at the age of 28. But Donato and Ranger subsequently played in a trio with Rollins himself, in a Toronto gig that Ranger identified as one of the highlights of his career [p. 91]. One of the many great strengths of this book is Miller’s knack for evoking in words the essential qualities of music in performance. Here is his take on Ranger’s own composition Le Pingouin (The Penguin): “[it is] a variant blues whose descending, chromatic four-note bass vamp evoked a penguin’s waddle, with a rather jolly melody on top to heighten the comic effect and a series of short single-note glisses to suggest, perhaps, slips and slides on ice … Twice in the 10-minute performance … he played at length off that brief bass vamp, setting out a deft pattern of counter figures on snare, bass drum, hi-hat and ride cymbal in the manner of Max Roach, and then breaking into a brisk, galloping sort of swing irresistibly his own” [p. 61]. Le Pingouin was recorded for a CBC LP of the Brian Barley Trio in 1970 and reissued on CD in 1995; it is now available on iTunes. Other examples of Ranger’s playing are available online via YouTube and elsewhere. Miller’s discography lists over two dozen recordings featuring Ranger; most are no longer available, but in any case much of the notice that he garnered came from his live appearances, still remembered by those who heard them as spell binding performances. Ranger comes across in Miller’s account as a single-minded, daring, inspired, but utterly uncompromising figure: a hard drinking, chain smoking guy with a strong streak of bad temper. He played drums, but impractically never learned to drive, and hence was reliant upon others to get his kit from gig to gig. At his best, he was a force to be reckoned with and capable of true musical greatness; at his worst, he would just go through the motions or even undermine his fellow musicians. As Miller memorably puts it, “there were no limits on what he was able to do – only on what he was willing to do” [p. 96]. Despite the fact that he has been compared to Elvin Jones, Coltrane’s drummer on A Love Supreme, or to Tony Williams, who joined the Miles Davis Quintet at the age of 17, Ranger was a true Canadian original. Ranger could be devastated by setbacks that other musicians would take in their stride. Miller reports that he was “despondent” [p. 165] when his quintet did not win a competition that was part of the Festival International de Jazz de Montréal in 1986, and quotes others as stating that he was “hurt deeply,” “totally depressed,” and “destroyed” [p. 199] after a single bad review in 1990 of the 12-piece Jade Orchestra, into which he had poured his energy during his early years in Vancouver. Music was everything to Ranger; he was passionately devoted to it at the expense of all else: a middle class existence, money, his family, friendships, teaching, indeed all other aspects of life. His playing matched his mood: if he was angry or upset about something, he would just walk away, even in the midst of a gig. As Miller notes, “it was a tribute of sorts to Ranger that Koffman, Greenwich and other bandleaders were prepared to cope with him at his worst in the perpetual hope that he might be at his best” [p. 132]. A Western tour in November 1991 with Jane Bunnett and Larry Cramer, along with the noted US sax player Dewey Redman, was what Ranger termed “the zenith” of his career, and in particular one evening in Saskatoon: “Everything,” he said, “was just right” [p. 210]. Redman for his part later said that Ranger was the greatest drummer in the world, a comment that eventually made its way back to Ranger, who was understandably pleased. But within a couple of years of that zenith, Ranger was on welfare, trying to quit his various addictions, and diagnosed with a bipolar disorder that was treated with lithium and therapy. His last significant engagements were in 1995 and 1996 in Victoria, after which he played a duo recital with Dave Say on tenor sax in Nanaimo in May 1997. Sadly, he then sold his drums in the summer of 1997 to pay for dental work, and subsequently tried unsuccessfully to borrow them back for his last public appearance on June 28, 1998. He then quit music and may even have been homeless for a while; he was likely on welfare and thus not able to work for fear of losing his social assistance. After a couple of years on the skids, he finally went missing in November 2000. The focus throughout this account is understandably trained with a laser-like intensity on Ranger. Miller seems to work in at least a mention of every single public appearance that Ranger gave in the course of his 40-year long career. Ranger’s personal relationships are covered a bit more sketchily. Suddenly in Chapter 11, half way through the book, a woman named Ali Karnick, a US casting director working in Toronto, is introduced; she and Ranger live together for four years (ca 1980) in her comfortable house and she saves his career, getting him Canada Council funding by writing up and submitting the application in 1982. But there is no mention of what had become of Ranger’s wife Denyse and their four daughters, who disappear from the narrative on p. 84. (Lani, the youngest daughter, is among those whom Miller interviewed for the book.) In Chapter 13 Ranger abruptly leaves Karnick to move in with Lili Wheatley, an artist who had expressed an interest in his music; she too disappears from his life in the early 1990s, “no longer able to abide his drinking” [p. 215]. In Vancouver he lives for a few years with Judith Yamada, introduced only as “a woman he had known from Montreal” [p. 215-16]. Ranger finally ends up alone in public housing by 2000, in Aldergrove, where he was to meet his untimely end. It is likely that what Miller includes about Ranger’s personal life is all that is known, or all that those who knew him are willing to divulge. What remains is his recorded legacy – not, unfortunately, nearly extensive or representative enough, by all accounts – and the influence he exerted on other Canadian jazz musicians by his example and his forays into teaching. As Miller noted in a Facebook post, among those few truly legendary figures in Canadian jazz, “Ranger seems to live on most vividly in the collective imagination of the Canadian jazz community”. Thanks to this book, Miller has ensured that Ranger’s career and reputation will extend beyond that focused community and have both a broader reach and a more lasting impact.